Marsha Serlin of Chicago area company gifts each employee with $200. in Cicero, Illinois, in a photo from the 1980s. Marsha Serlin, founder and CEO of Cicero, Illinois-based United Scrap Metal, is giving $200 to each of the company’s 500 employees to recognize the 40th anniversary of the company’s founding. The first gifts were scheduled to be presented Oct. 15 in St. Louis, followed by presentations in Indianapolis, Philadelphia, Charlotte, Chicago and Richmond, Virginia. A news release issued by United Scrap Metal describes Serlin 40 years ago as newly divorced, saddled with debt from her former husband’s failed business and a single mom with two young children. Her home was in foreclosure and her car was repossessed. “Let’s say I was highly motivated,” she says now of her effort to succeed in the scrap metal sector in 1978. United Scrap Metal has been recognized with more than 50 awards, including an Illinois Recycling Association Lifetime Achievement Award, several best places to work awards and others. The company gives back in communities it serves through charitable donations and sponsoring events such as the Ronald McDonald House Charities annual Recycling Day. United Scrap Metals says it supports more than 30 different non-profit and charitable organizations. When it comes to C&D recycling, Recon Services owner Walter Biel never settles. When Walter Biel started Austin, Texas-based Recon Services in 2005, the company was just a three-person hauling operation. Armed with two trucks and 20 roll-off boxes, the company originally set up shop in New Orleans post-Hurricane Katrina to help with the debris cleanup. It wasn’t until he came back to Austin that Biel decided to start putting his roll-off boxes on construction and demolition job sites throughout the area to collect C&D materials. But as the company’s operations grew to accommodate its hauling needs, so did the company’s geographical footprint. In 2010, Biel purchased 973 Materials, Central Texas’ largest concrete crushing facility, which gave the company the freedom to crush and process large volumes of debris in-house. After setting up shop on 973 Materials’ 100-acre former site, Biel opened a metal recycling yard to add another dimension to the company’s offerings. 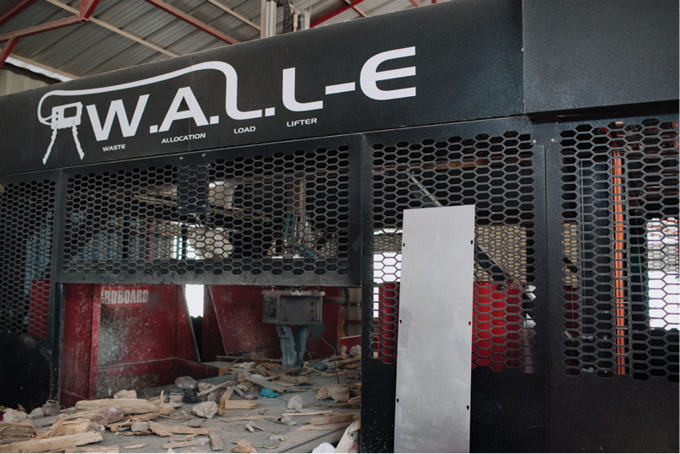 Then, in 2013, faced with escalating landfill rates and ever-growing quantities of materials to process, Biel made the decision to start a recycling line to process its comingled C&D materials in a more efficient, economical way. After two years of running the company’s first recycling line, Biel decided to bring in New Brunswick, Canada-based Sparta Manufacturing in 2015 to help further refine Recon’s recycling facility operations. The company helped design the facility so C&D materials entered the facility through a hopper, were screened by a two-deck screener and then had the remaining non-wood waste sorted by hand sorters. While this new design helped increase the volume of recyclables the facility was able to generate and increased Recon’s recycling rate to 70 percent, Biel wasn’t fully satisfied by the sheer volume of material that was left for his sorting staff to pick through. After attending a local trade show and seeing Helsinki-based ZenRobotics’ artificial intelligence-powered sorting robots in action via video display, Biel started a conversation with Plexus Recycling Technologies, ZenRobotics’ U.S. sales partner based in Westminster, Colorado, about potentially incorporating the robotic sorters in his facility. Following numerous conversations and a trip to Europe to see these systems in person, Recon made waves by partnering with Plexus to become the first recycling facility in the Western Hemisphere to incorporate a robotic sorting system into a C&D operation when its two robotic arms were installed in 2017. The automated system runs off of sophisticated software and sensors that can be programmed to target 12 different kinds of materials up to 45 pounds in weight. And since the robots’ smart grippers have an opening range between 0.75 and 25 inches, they can sort objects of various sizes and shapes. At the Recon plant, the robots pick 12 different kinds of materials and can even separate plastics based on polymer, color, shape and size. In all, the robots can make roughly 2,000 picks per hour. By comparison, humans can make approximately 800 picks per hour. 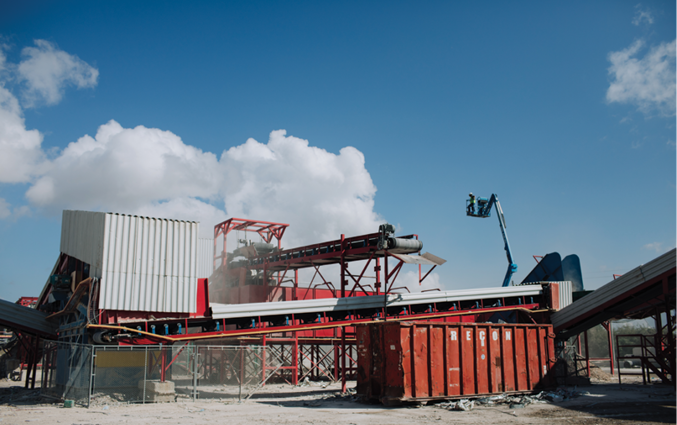 Biel’s initiative in introducing this sorting technology to his facility helped Recon Services get recognized as the 2018 Construction & Demolition Recycling Association (CDRA) Recycler of the Year, as well as the Texas Environmental Excellence Awards (TEEA) 2018 Winner for Innovative Operations/Management. Although the efficiencies garnered from the introduction of the robotic sorters helped improve processes and push Recon’s recycling rate north of 80 percent, Biel realized more work could still be done. 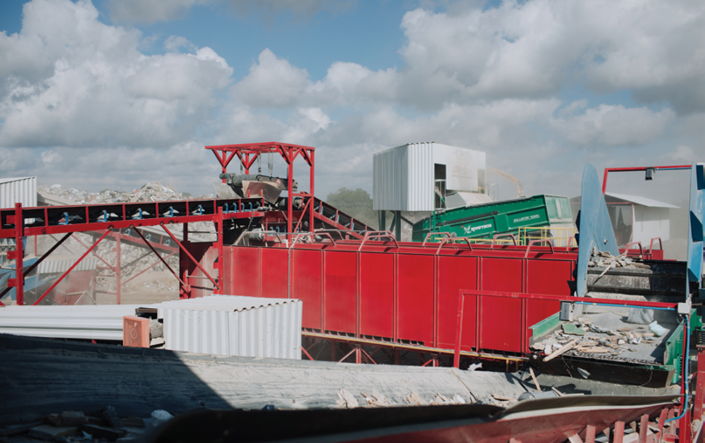 Since the incoming material stream was only screened initially with a two-deck screener, the conveyor often became cluttered with fines and other types of debris. This made it difficult for the two robotic arms to properly sort through the incoming feedstock. With increased diversion and a new recycling ordinance from the city in mind, Biel made the decision to once again revamp his facility this summer. “Our business continues to grow and expand. So, for us to meet our needs on the hauling side, our new city of Austin ordinances that stipulate that all projects over 5,000 square feet are required to recycle 50 percent of their construction debris, and the needs of our third-party haulers, we made the decision to expand to accommodate more material and to do it more efficiently,” he says. The most recent redesign featured the introduction of a new Terminator 5000S from Austria-basedKomptech for preshredding, a Komptech Ballistor 10300 ballistic separator for separating out fines and flats, three Keith Walking Floor bunkers from the Madras, Oregon-based company, and a B-66 E grinder from Rotochopper, St. Martin, Minnesota, for grinding. Under the new facility design, incoming material is passed through the Komptech Terminator 5000S preshredder, which sizes everything to 30 inches. This material is then sent through the Komptech Ballistor 10300 ballistic separator. According to Biel, the new ballistic separator has allowed Recon Services to process materials in ways that weren’t possible before by ridding the line of two-dimensional debris such as paper, cardboard and plastic that can clutter the belt. After the ballistic separator discards some of the two-dimensional material, the remaining material is sent to Recon’s bunkers for metals to be taken out via magnetic separation. The resulting feed is fed through the company’s robotic sorting equipment, which is overseen by a couple members of Recon’s staff to ensure smooth operations. Although it is early in the plant’s latest redesign, Biel says the company’s recycling rate has already risen to 85 percent for the year based on its Recycling Certification Institute (RCI) numbers. With its new line, Biel thinks that the company can approach a 93 percent diversion rate. “So far, investing in these technologies has opened our eyes and allowed us to see that we can process more material and do a better job at it by having these key pieces of equipment in place,” Biel says. The company that started with just three people 13 years ago has now grown to a staff of 85. And while the investment in new equipment has resulted in some workers being reassigned to different tasks, Biel says the expansion has been beneficial for everyone involved. Biel says his recycling line is currently running 50 hours a week, and within 60 days, he envisions being able to automate his plant part time with the help of a few quality control staff overseeing operations—something that he never would’ve thought possible a couple of years ago. While Biel is committed to continuing to invest to fine-tune his current operations, he says the next step for Recon Services could involve taking the lessons they’ve learned building their business to expand to a new site. The author is the editor for C&DR and can be contacted at aredling@gie.net.